The true subject of Manet’s paintings and their stunning visual illusions might have been revealed long ago if viewers had not been so ready to accept the customary habits of perception. 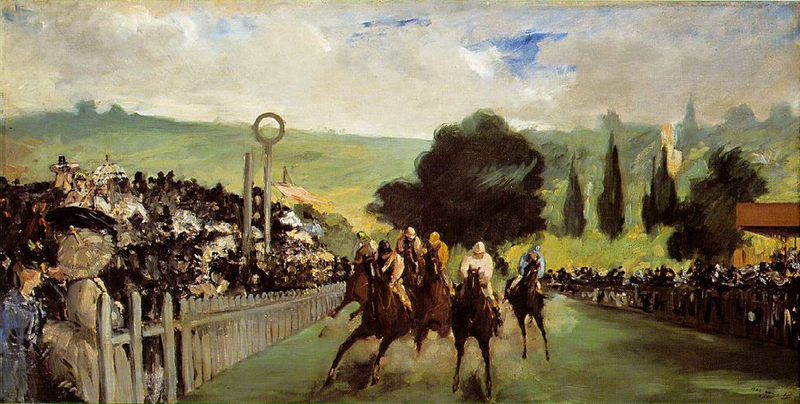 His paintings of horse races are an excellent example because, using normal perception, the first composition he painted looks incredibly modern while a later one is hopelessly old-fashioned. Experts should have realized: something's wrong here. Let's see what it is. 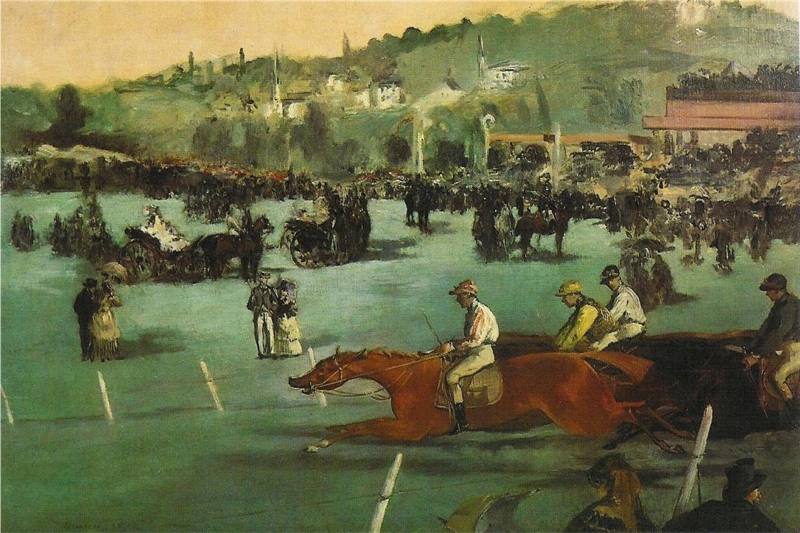 Manet, Races at Longchamp (c.1867) Oil on canvas. Art Institute of Chicago. Five years after revolutionizing the depiction of a horse race Manet painted a scene that, through normal perception, is painfully outmoded. 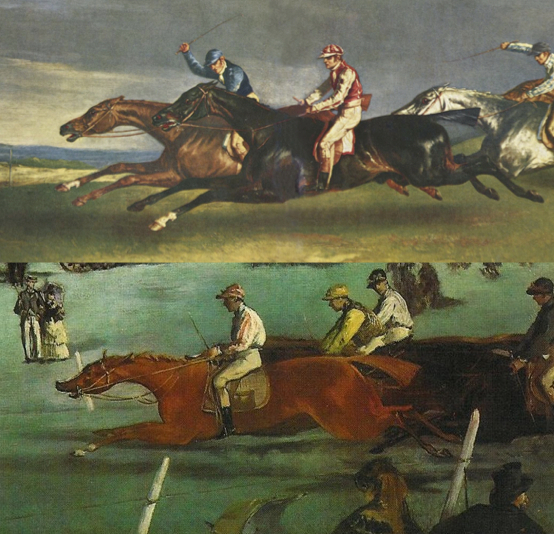 John Richardson observed that unlike Degas "who knew from experience exactly how a horse's body was articulated, Manet copied his stylized animals from English sporting prints. 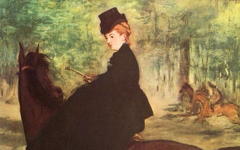 "2 Degas, of course, was famous for painting horses; Manet not. As so often in Manet's art, this is a scene in the artist's mind of the painting's own creation which is why the subject of the painting has merged with the studio setting. 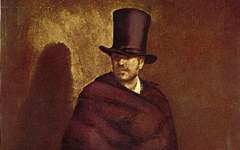 Degas-as-Gericault-as-Manet paints "his picture". The large post by Degas' shoulder, the most prominent, touches his "composition" and is probably, like the tool in Courbet’s Stonebreakers, a substitute for his brush. 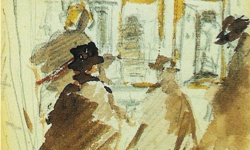 The woman next to him, in a mirror-position to Degas' own body, is the feminine half of the artist's mind and indicates its androgyny. 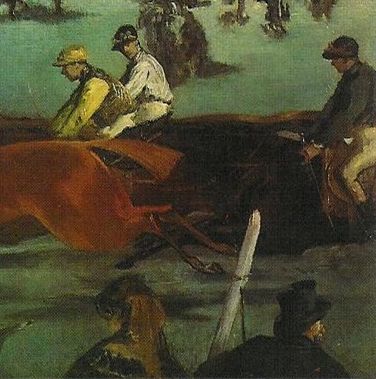 Degas’ presence and the odd style of the horses has long been known so that the possibility of normal viewers recognizing Manet's visual illusion has always been considerable. Still no writer until now has ever noted that while Manet's apparent subject changed from painting to painting, his underlying theme remained the same. This failure led writers to describe Manet's art as ‘inconsistent’, especially in relation to the work of his contemporaries, Monet and Degas, who repetitively painted the same subject on the surface. Remember all those horses, haystacks and whores? Yet Manet never changed his subject, at least in his major works, as you can now see in the examples on this site. Enjoy them. Original Publication Date on EPPH: 23 Jan 2011. © Simon Abrahams. Articles on this site are the copyright of Simon Abrahams. To use copyrighted material in print or other media for purposes beyond 'fair use', you must obtain permission from the copyright owner. Websites may link to this page without permission (please do) but may not reproduce the material on their own site without crediting Simon Abrahams and EPPH.